handover | Windancer - Stairway to ...Heaven? Mwell, if you do, then you’ll be happy to see I am still here, live and kicking. Lately I’ve focused on writing stuff for my PhD and therefore no techie article and very slow reply to answers (promise to get back to those who still have no answers to their inquires). 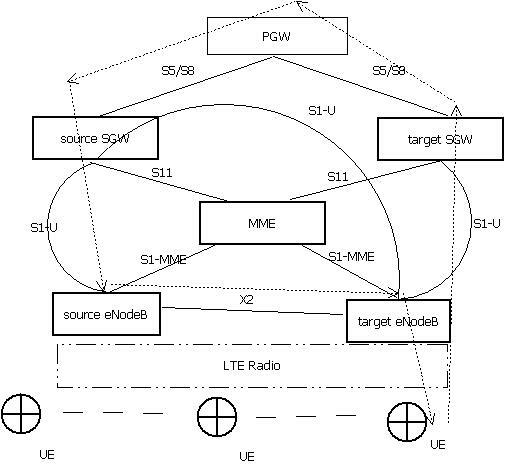 Today, applauses for the 3GPP guys: they don’t expect the operators to simply put a Stop to whatever they were doing, upgrade to 4G every piece of their equipment, then Start over. Au contraire…mon frere 😛 They provide a way (actually, 2 ways) of gradually upgrading a 2G/3G network to a 4G fancy network. Today, I’m gonna present briefly one of them: Iu mode inter-RAT Handover. This is also a subject for my next article – but I’m not going to copy-paste it, as it might get rejected. 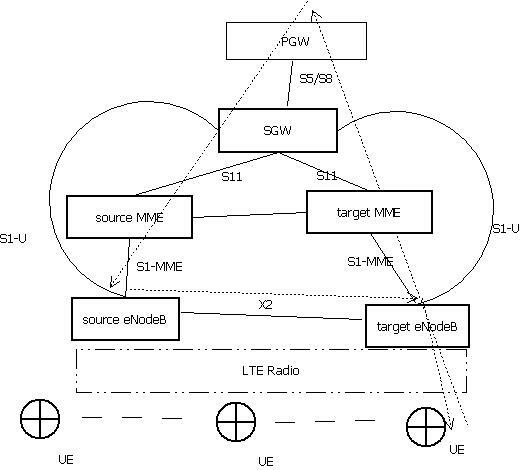 First of all, let’s take a quick look at how those fancy network equipments connect to each other in a 3G-4G handover case. Mwell. So, what do you have here? From the 3G side…. (applauses…applauses): a RNC and a SGSN. 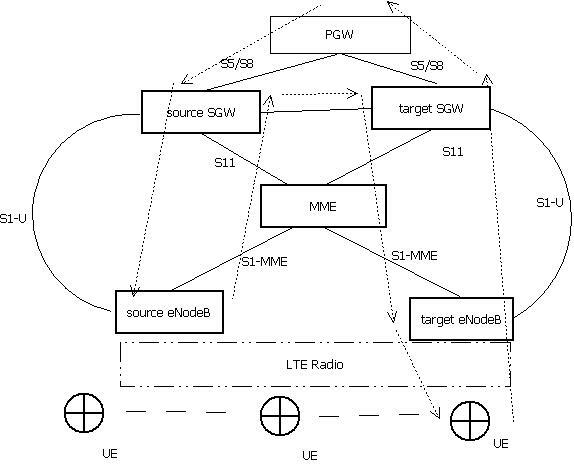 We assume our UE is connected to a 3G network. But, as the operator has (at least partially) upgraded to 4G, there is no more GGSN. 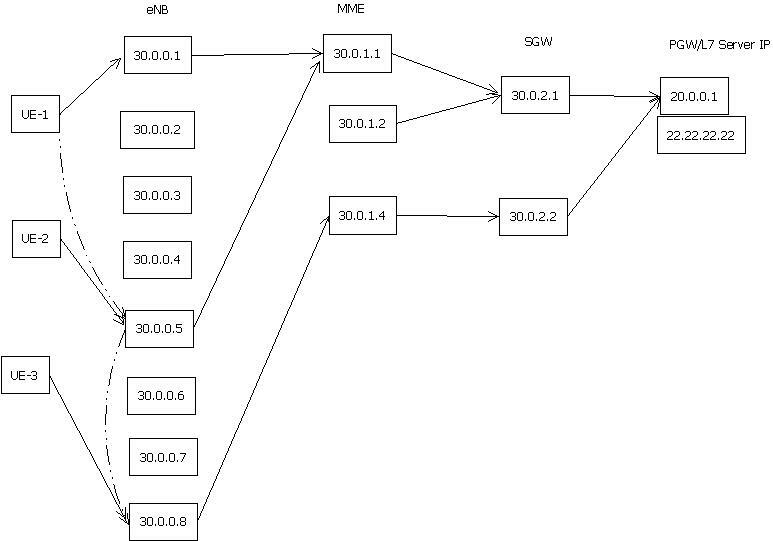 The SGSN is connected to the SGW via S12 interface. 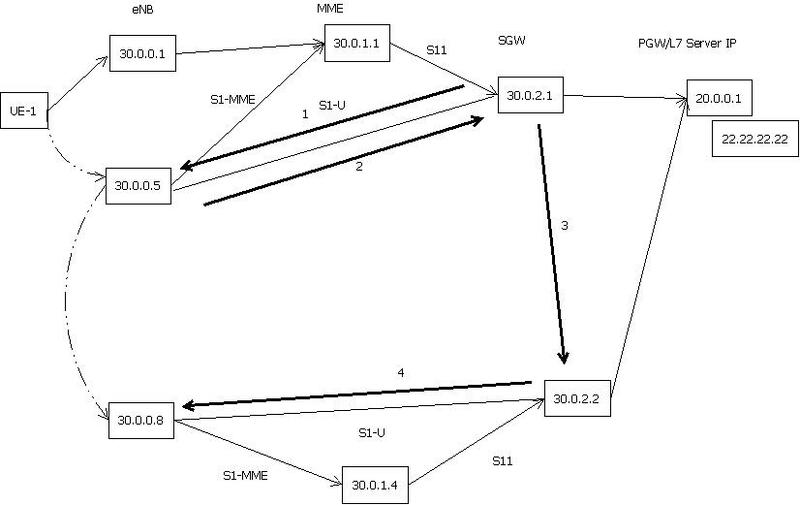 Unlike MME, which is a dedicated control-plane device, the SGSN transfers both control-plane and user-plane information. The simply dotted lines in the picture represent the air interface. 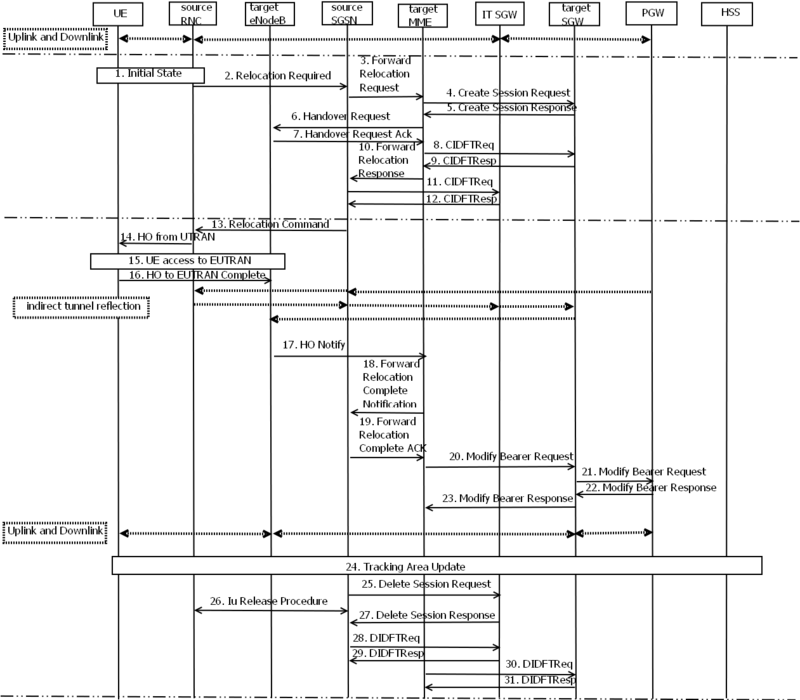 The dotted and stroke connections represent interfaces where there are two types of traffic being delivered: control-plane and data-plane. 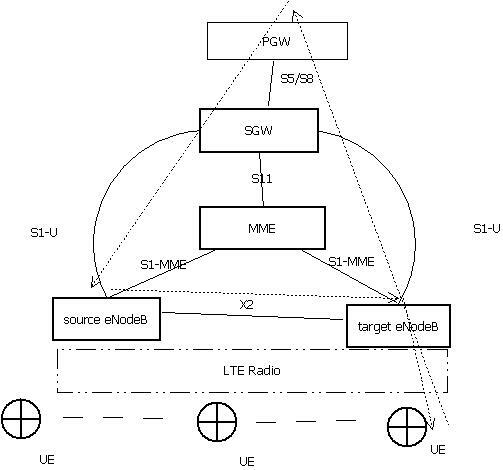 On the 4G side, the usual and familiar elements: eNB, MME, SGW. The PGW, HSS and PCRF are there to stay. The SGSN talks to the MME via the S3 interface. And, in this case, the handover will directly forward packets from the source RNC to the target SGW via the S12 interface. 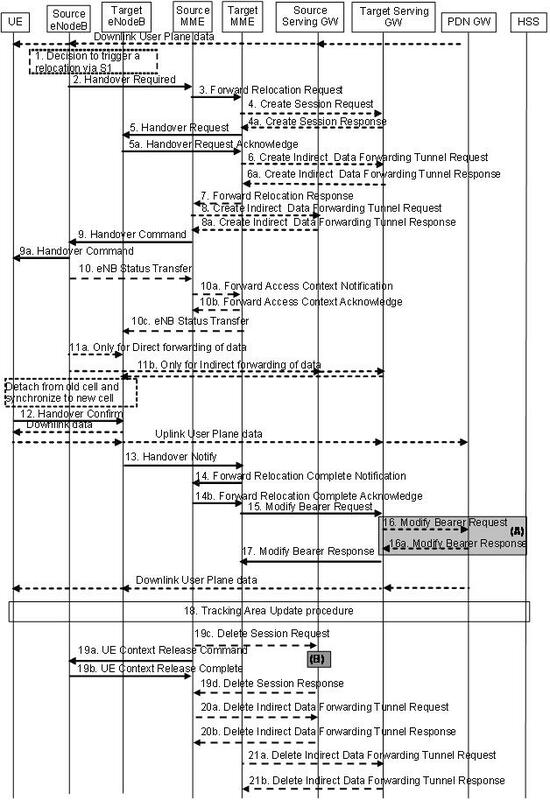 If you consider that the S12 interface does not exists, then we are facing a case similar to what we call “indirect tunneling” in the intra-EUTRAN handovers. 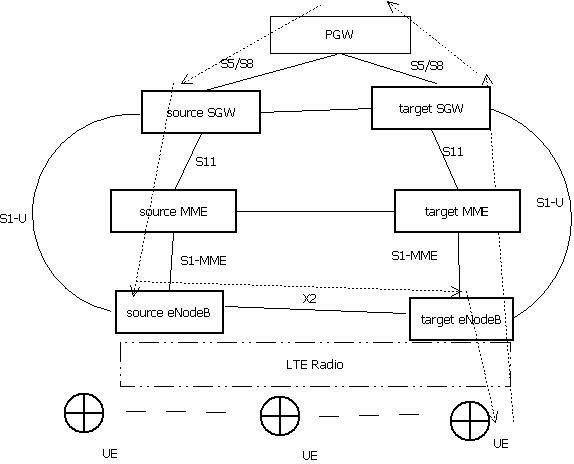 In this case, when the source RNChas no direct way of forwarding the UE’s packets (those that are sent in downlink after the UE had already moved to 4G) to the target SGW, it will use the S4 interface to forward these packets to a dedicated SGW for indirect tunneling.